The recipient of the 2018 Outstanding Faculty Mentor Award is Associate Professor of Theatre Rachel Briley, head of the M.F.A. program in Theatre for Youth and artistic director of the North Carolina Theatre for Young People, a regionally-prominent touring company that brings live theatre performances, outreach programs and theatre education to thousands of youth in North Carolina and beyond each year. Briley has mentored students at UNCG for 17 years, directing and teaching many aspects of theatre, including visual theatre, puppetry and drama that encourages community involvement. For her, collaboration with students is the key to successful mentorship, and she works on helping them bring their own skills to the studio and the stage. In addition to helping students develop their performance skills, Briley gives them opportunities to engage in outreach through events such as Educators’ Evening, where they connect with teachers who bring their classes to performances. Through her work with Deaf theatre she also gives students exposure to performance practice that is inclusive and accessible. Briley not only mentors directly, but also brings visiting artists to UNCG from across the globe to work with students, including the Chilean group La Llave Maestra, who performed at UNCG Auditorium last year. The artists worked with UNCG students for several weeks after the performance, as well as with students at the Doris Henderson Newcomers School. Briley creates opportunities for UNCG students to perform and collaborate abroad as well. This past year, her students performed at the Old World Theater in Delhi, India, and one of her graduate students will create work in Grenada this summer with the assistance of the prestigious Ann Shaw Fellowship, awarded by Theater for Young Audiences/USA. The hands-on experience Briley gives to her students serves them beyond their degrees, as they secure internships and professional opportunities in theatre. She often continues to advise them after they graduate and advance into their careers as directors, performers, producers, educators and professional theatre-makers for young audiences. Read more about Briley’s work with La Llave Maestra in UNCG Research Magazine. The recipient of the 2018 Thomas Norwood Undergraduate Research Mentor Award is Associate Professor of Classical Studies Dr. Joanne Murphy, who has made a tremendous impact on undergraduate research throughout her six years at UNCG. 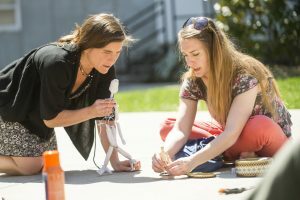 In addition to supporting undergraduate research and mentorship across UNCG as a whole, she involves undergraduate students in all of her research projects, which focus on Greek Bronze Age archaeology and archaeological methods. Each summer Murphy directs an interdisciplinary archaeological field project in Greece on the island of Kea. 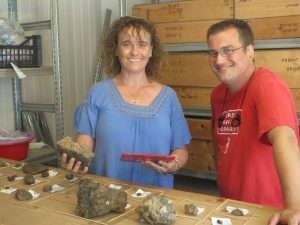 Through the program, students work with specialists in archaeology, petrography, chemistry and pottery. More than 70 students have attended the program to pursue hands-on research in archaeology. Her students have presented at multiple academic conferences, and have published peer-reviewed essays in the state undergraduate research journal, Explorations. As UNCG’s Undergraduate Research fellow, Murphy has helped to develop a variety of high-impact experiences for students on UNCG’s campus, and also across the state. She served as the co-principal investigator on two UNC System-wide grants to fund undergraduate research development throughout North Carolina’s public universities. Read more about one of Murphy’s students, Ena Prskalo, in UNCG Research Magazine.